← New book launch Planes Traines and Sinking Boats + Special Offers and Competition give-away! This past Bank-Holiday Monday saw the weird and wonderful calendar of oddball traditions and activities in Britain move to Coopers Hill in Gloucestershire. Though the world media concentrates on sporting events such as Wimbledon, Badminton Horse Trials, Sailing, Formula 1 and The Open what most of us are interested in are much more low-key events spread throughout these few summer months. Whether it be nettle-eating contests, conker championships, worm charming tournaments or a variety of other idiotic pastimes, there is something for everyone in the oddball sporting calendar in Britain. 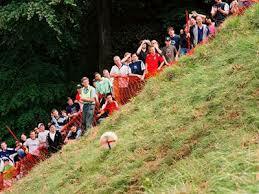 Perhaps one of the highest profile of these is the annual Cheese rolling event in Gloucestershire. 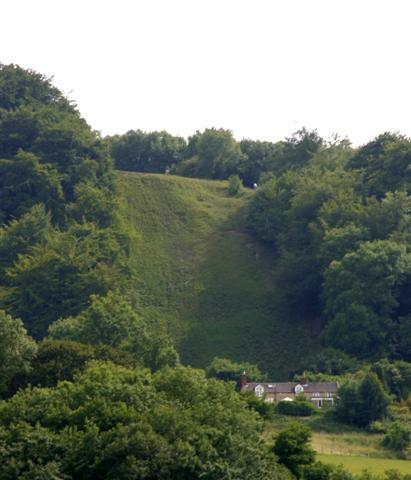 Cooper’s Hill, site of the annual cheese rolling down the hill competition. Coopers Hill is a steep hill of about 500 feet (with an approximate 70 degree incline and sees the madcap and ever so slightly suicidal sport of chasing a giant circular cheese down the hill with the person who first grabs the cheese at the bottom of the hill being declared the winner. It’s not so much the 500 feet height that makes this race difficult but the almost sheer drop over the hill as this photo indicates. As totally bonkers as it may seem, this annual event has been going on now for about 600 years and can see up to 15,000 spectators to witness the event. The hill is incredibly steep and many competitors roll head over heels repeatedly whilst others run like crazy before going flying, picking themselves back up only to fall over time and again. Due to the steepness of the hill there are frequent injuries such as dislocated limbs, broken bones and cuts and bruises but so far no-one has ever been killed and the number of people who have had to be carried out to a hospital are remarkably few and far between although in 1993 15 people were injured, 4 of them seriously. In recent years, authorities have half-halfheartedly tried to clamp down on the sport and for the last few years it has been held unofficially, the deeply ingrained love of the wackiness of the event meaning that locals, spectators and participants aren’t going to let broken necks get in the way of a good time. Diane Smart, cheese-maker to local markets and even Fortnum and Mason in London has supplied cheese for this event for over quarter of a century. This year it has been widely reported that the police have intimidated the 86-year-old cheese maker into stopping providing the cheese in case any injured competitor might try to sue her as an “organiser”. As ridiculous as it seems, the police claim they were only informing Diana Smart of the possibility though it would be imagined that after over 25 years of providing the 3kg (7lb) wheel of Double Gloucester would already have worked things out for herself. As the wheel of cheese can reach speeds in excess of 70 mph, even spectators are at risk of injury if the cheese hits a bumps and changes direction. Competitors get down the hill as fast they can, anyway they can. 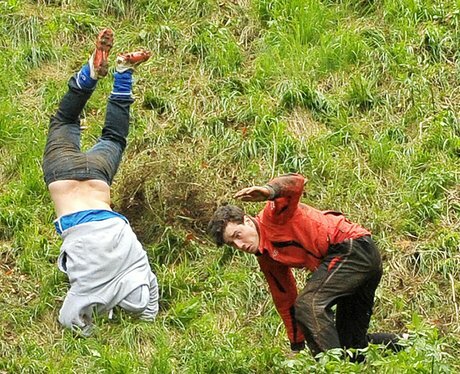 Sometimes tumbling over can be quicker than just running! There are 4 races held during the afternoon and are categorised into men, women etc and in recent years have attracted people from around the world. With last years mens winner currently serving in the British Army, this years winner in the form of Kenny Rackers, a US. Army veteran had travelled 4,000 miles from Colorado Springs just to take part in the contest. Kenny Rackers wins the first big cheese! “I came over specially for this and I did what I had to do to win,” he said afterwards. “It feels great, I trained a long time for this and got hurt on the hill practicing. I came three days early and I took a bad spill, but I came to win and that’s what I did. Rackers won the opening race. Australian traveller Caleb Stalder claimed the second. Student Lucy Townsend, 16, from Brockworth, won the women’s race for the second consecutive year. Local Ryan Fairley, 23, from Brockworth, won the third men’s race – the first time he has claimed a cheese. The fourth men’s race was won by Tomoaki Tanaka, 39, from Japan, who dressed as a ninja to race down the hill. Sometimes the later races are delayed to allow ambulances the chance to return from the nearest local hospital but this year went without a hitch until the last race which was marred by an injury to a competitor who injured his ankle falling over. In a typically old-fashioned way, the winner gets no prizes other than their injuries and of course the very tasty Double-Gloucester cheese. There are some things that money just can’t buy! This entry was posted in Cool Britannia, Funny & Humour, Heritage and tagged Cheese Race, Coopers Hill, countryside, County of Gloucestershire, Culture, Funny, Heritage, Life, tradition, UK, weird news. Bookmark the permalink. 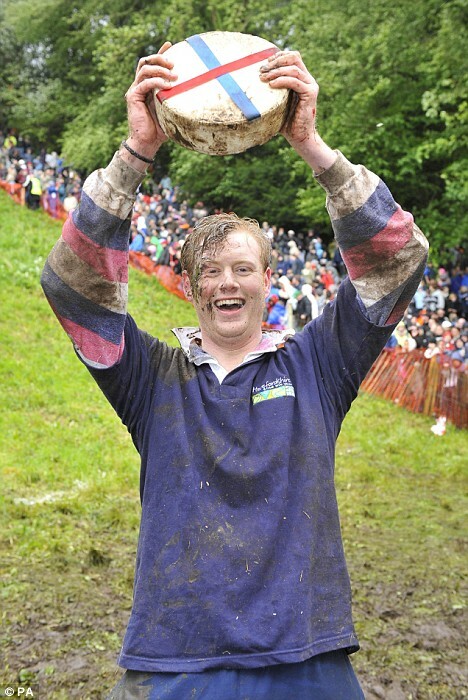 35 Responses to 2013 Annual Cheese-Rolling Race! 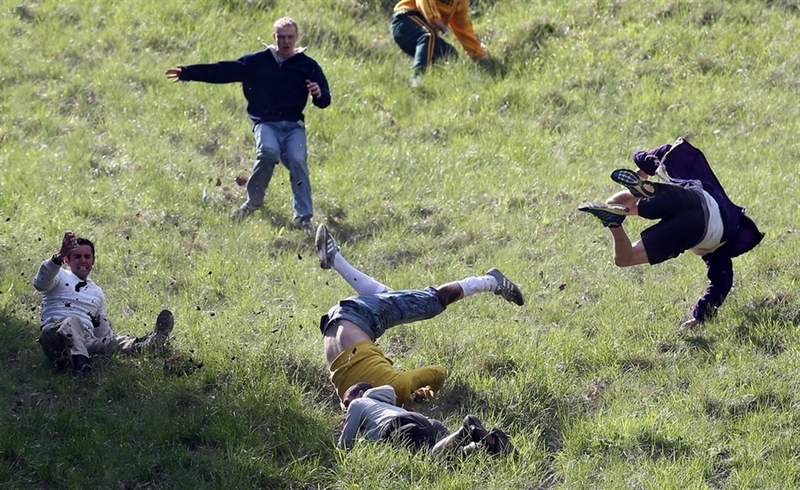 This blog is quite amazing – we too have a cheese-rolling competition in Italy – though the rules are slightly different. You actually throw the cheese and try to get it as far as possible. See http://www.figest.it/Lancio_formaggio.php for more information. That is incredible. Thank-you for commenting. I guess if an idea is good enough or stupid enough more than 1 person will try and make a sport of it. Maybe people in the old days had less ways of spending their spare time! This is an absolutely wonderful 600 year tradition! With the “organiser” now 86 I hope there is an apprentice cheese maker waiting in the wings! She does have a son or perhaps a grandson who is in the cheese-making business so hopefully the event will continue. Apparently in the old days it was an even bigger event and part of a communal Fayre with lots of farmers giving out food to the people and a variety of stalls and events going on but now all that remains in the cheese-race. A) I wonder if there are jobsworths trawling around the Isle of Man TT warning the organisers they could be sued if someone is killed? B) Concerning the event, and 600 year-old tradition cannot be bonkers. Yes it makes one wonder what other sport or past-time they try to ban next. Rugby, rock climbing, road cycling, horse racing? What they always forget that by the very act of trying to make it illegal gives it much more support amongst the locals. I hope the tradition continues for at least another 600 years and you’re right it isn’t bonkers. What’s bonkers is that anyone should try and ban it. Didn’t they ban or try and ban conkers in school playgrounds a few years ago in case a child knuckles got bruised o9r cut? If 6 or 10 year old can’t take the odd cheesecutter conker to the hand then they probably aren’t ever going to amount to much. If people want to run down hills chasing cheese or ride motorbikes then they should be able to as long as they don’t hurt anyone else. If they get hurt, its not the fault of an 86 year old lady, it’s just tough cheese! There are too many health and safety people around these days. I lived in Gloucestershire for two years (1968-1970) as a boy. I remember going with my family to watch this race. My mother was worried my father would join in the race, but he chose not to. I remember reading that the origins of the race were in Roman Britain. The Romans held a race on the hill, only it was a wheel that people chased down the hill. Another bit of trivia concerning the race is that during World War II, there was only a piece of Gloucester cheese in the box rolled down the hill due to rationing. I remember seeing people carried off the hill by ambulance attendants in the races ran at the end of the 1960s too. Wow, that must have been great to see the event live as a boy. It is incredible if it has been going on since Roman times. I think it is great that even during rationing in WW2, they still carried on the tradition. Many thanks for your comment as always. I think if a tourist just by good fortune happened to witness the event, they would probably think it the most bizarre thing they had ever seen. I like it how even in the modern world, these unusual activities can still take place. Yes, it is quite amazing. If you google it, there are plenty of videos of previous races to watch. I love that one of the winners actually traveled from Colorado in the U.S. to compete. Great bucket list checkoff. Yes, that’s great. How brilliant to travel half round the world to win a race chasing a giant cheese down a steep hill. I am glad that I brightened up your day. Yes we are a little eccentric! I am sure the good folks of Boston would never have had their tea party if they’d only known they would miss out on the cheese-rolling race! So true ….and now Boston has worse worries. I passed your blog on to my son, who is about your age. He travels around the world with his business and may some day just show up at the Annual Cheese Rolling Race. Is it always held in May? Yes it is always held on the second Bank Holiday in May which is usually the final Monday of May. They have a website but I don’t think you have to register or pay. I think you just pretty much turn up on the day. Oh Stephen, as always so imformative and entertaining! I am pleased you like it. It is always nice to know that I am doing my ‘job’ well! I’ve heard about this event. That hill is insane. I’m surprised more people don’t break their neck in this race. It must be quite a spectacle to see, Stephen. Congrats on the launch of your new book! That’s wonderful. Yes it is one of those steep inclines that most people would come down slowly on their bum, one step at a time! They always put on 30 seconds of it at the end of the news to brighten up everyones mood. Thank-you, I am over the moon with it! Great post! I enjoyed it. Well I like cheese too. Thank-you. Yes I would like cheese too and would be tempted to wait at the bottom and take the cheese home with me! Oh, wow! This is such a great tradition!! 🙂 (I saw a challenge similar to this featured on the Amazing Race… I wonder if it was done at the same location, because the hill had seemed very steep!). Thanks! Yes it will be well worth popping over for. Thanks for stopping by my blog! This post made me smile from ear to ear today! I have often felt the stork dropped me off on the wrong continent as I feel such a very strong pull for England and everything British…but this just confirms it for me!! Wish I could have been there! Epic! I’m so glad that you enjoyed it. Maybe a few of us from WordPress could meet up there next year and have a bloggers race 🙂 Not sure there will be much writing done for a few days afterwards though!